And reveals to the world the difficulty he encountered while attempting to buy a house with his punk rock indie cred. We all know that engaging internet commenters in any way is usually a bad idea, but this was pretty funny. David and Patton, kiss and make up! Distilling the Moral of "Atonement"
The lesson I got out of "Atonement": if you have a gummi worm growing out of your chest, you should get it looked at. Thank you to everyone who sent along songs for my road trip: we're good to go! (I'm in "how am I going to do everything I have to do before I leave town" mode now.) Thank you thank you thank you! Co-worker: Is the color printer broken? Me: Yeah, it's been broken for like, a week. Co-worker: Why didn't you tell anyone? Me: Uhh, because the thing I was trying to print was a map of all the Cracker Barrels between New York and Florida? Make it this successful one: Yup Magazine. Give Me Music for My Insane Road Trip! 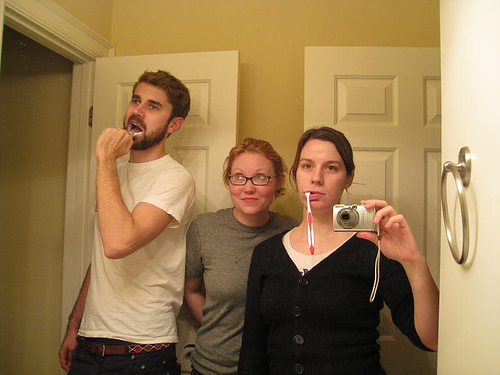 This Friday, my friends Stephanie, Shaw and I are driving over 1000 miles down to Georgia and Florida for Christmas. Everyone knows iTrips don't work, so we have to burn cd mixes for our trip. If you're compelled by the kindness of your heart to yousendit us some road trip songs (The perfect road trip song is familiar, fun, and nostalgic - I got the idea for this experiment in shameless begging when I realized I don't have "Freedom 90" by George Michael on CD, if that gives you any indication of what I'm talking about here.) My email address is lindsayATlindsayism.com. Send me your favorite road trip songs! Yay! Happy Holidays! And was told that I only have three references: Scheherezade, Rashomon, and Icarus. Which is not true, because I also apply Occam's Razor to everything, so I have four. Also Kid Nation related: this is funny. Max Silvestri: Sophia got the most money, right? Max Silvestri: She earned it. Max Silvestri: That'll be a nice nest egg for when we marry. Game: What is the Most Out of Fashion Thing That Still Cannot Be Worn Ironically? "Meet Whitney Port! December 14 from 1-2 pm on the third floor of Bloomingdales 59th Street. When you purchase Clinique Happy 3.4 ounce, make it a special customized gift by adding a picture of you and reality tv star Whitney Port!" As tempted as I am to make "special customized gifts" of sure-to-be-treasured pictures of myself with Whitney for all of my friends, Clinique Happy smells like a forgotten orange left over the weekend in a second grader's lunch box. The kids will get a "hear wrenching surprise" in the season finale of Kid Nation tonight. I'll be writing about it tomorrow on Vulture. Last night me and Stephanie watched Singles. Has anyone ever noticed that as time goes by, Singles gets better and Reality Bites gets worse? Update: Also, if you're exactly our age, remember when you had to have a crush on either Kurt Cobain or Eddie Vedder? We were both Vedder girls all the way. (In comments) "Satire should be obvious."